Fiction – hardcover; Quercus; 336 pages; 2010. In recent years I’ve read several short story collections masquerading as novels. For example, both Alaa As Aswany’s The Yacoubian Building and Nicholas Rinaldi’s Between Two Rivers told the individual and interconnected stories of residents living in the same building, the former in Cairo, the latter in Manhattan. Colum McCann did something similar in last year’s prize-winning novel Let The Great World Spin, using Philippe Petit’s daring high-wire act between the Twin Towers in New York City on August 7, 1974 as a kind of bridging link to tell the stories of a diverse range of characters living in the city at that time. Even Christos Tsiolkas has got in on the act: his Commonwealth Prize-winning novel, The Slap, looks at the lives and loves of various residents in the Melbourne suburbs, using a controversial slap at a family barbecue as the particular incident that links all the short stories together. 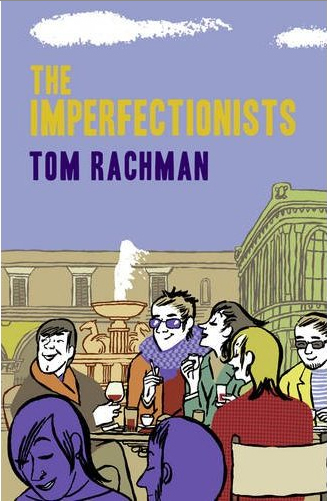 Tom Rachman’s The Imperfectionists uses this structure too, but this time the link is a busy newspaper office in downtown Rome where each of the characters is employed. The unnamed paper is an English-language publication with a global readership and is largely staffed by expat Americans. There are 11 characters all told, so that means there are 11 short stories, each of which are roughly 25 pages in length. That’s plenty of space to flesh out their eccentricities and foibles, and to develop them into fully-rounded human beings. But not enough that you get more than a brief snap shot of their present day lives circa 2007. In between each chapter (short story) Rachman provides a brief update on the newspaper’s progress, moving from its establishment in 1960 at a time “when nobody’s making real money out of something like this”, through to its peak in the early 1980s when circulation hit 25,000 and journalistic standards were high, and then charting its slow decline as circulations and revenues got hit, first by television then the internet, until the present day in which circulation is down, the paper lacks a website and closure looks imminent. It’s a fascinating potted history of the newspaper game, some of which cuts very close to the bone for this particular reader! The newspaper theme is borne out by the chapter headings, which are all headlines — “Global warming good for ice creams”, “Markets crash over fears of China slowdown”, “Bush slumps to new low in polls” — under which the relevant job title of the particular character is also listed — everyone from corrections editor, to news editor, editor-in-chief to publisher are represented. And while much of the content is tongue-in-cheek satire of journalism (think Evelyn Waugh’s delightfully funny Scoop and Michael Frayn’s Towards the End of the Morning), there’s an undercurrent of despair running through it, too: the highly experienced Paris correspondent, who has been replaced by “freelancers selling jaw-dropping stuff”, is so desperate to earn a commission he fabricates a lead story; the 30-something business editor who works long, hard hours is so lonely and starved of companionship she becomes involved with the dodgy Irish chap who burgles her flat; the obituary writer has been so sidelined in his career it takes the death of someone close to him to spur him on to achieve better things. As a novel, I’m not sure this is a great one, but it’s definitely an entertaining one and provides a humorous and realistic look at the rise and fall of the newspaper business. I have KevinfromCanada to thank for tipping me off about The Imperfectionists and would urge you to read his review for another take on the same book. Alternatively, you can wait for the film: apparently Brad Pitt’s production company has snapped up the rights to it. A very fair review, I think — both in the qualifications and the enthusiasm. While there is certainly some pathos in some of the characters (and that is a strength of the volume), there is also much humour — both sardonic and warm — that made it even more attractive for me. I forgot to mention that the UK cover is badly misleading (we did talk about this on my blog). The characters are made to look like goofballs and in the book they are anything but that. Pitt is going to have a great time casting the movie because a lot of excellent character actors will be chomping at the bit for the chance to play one of these 11 charming misfits. This is tops on my summer reading list once I dismiss the last of my lovelies for the school year! Glad to hear that it was an enjoyable read. Just knew that it would be. Did not realize that it took the form of the short story cycle but as I am a fan of this structure, still sounds appealing to me. This one keeps catching my eye (the US cover is wonderful), but I haven’t seen many proper reviews of it yet. (I think I missed the one at Kevin from Canada, but I’ll go take a look now.) I’m fascinated by newsrooms and the personalities therein, even though I’m glad to have gotten out of the one I worked in. It was a tiny weekly, but even then it was too intense for me. Give me a low-key monthly magazine any day. I have to admit that the cover has grown on me; I hated it at first but now I think it kind of captures the warm and funny aspects of the book. Plus, that chap on the left is a dead ringer for Stephen Fry! Its fun and easy to read, Frances. I read it in two sittings but you could easily gulp it down in one, especially if lying in the sun / by a pool / wherever you do your summer reading. Agree – the US cover is very nice – and quite classy looking compared to the British counterpart. I think newsrooms are always intense places no matter where you work. I did a weeks freelance work on a daily about 12 years ago – and hated it. Ive been on weeklys ever since – much more sedate! I think this could make quite an interesting film… theres certainly plenty of material to work with. But whether he turns it into a romantic comedy or a cutting-edge satire remains to be seen. Looks like a fascinating book, and you give it an insightful review. I have a preference for these books of stories disguised as novels. I bought a copy for my daughter and son-in-law, since they are practicing journalists. I’m sure they’ll enjoy it, Tony, and recognise a lot of characters they probably work with, either now or in the past. I have had this one on the radar for quite q while though I have no idea where I originally heard about it. I am also not sure why I havent run out and got it, in part I think its the cover puts me off a little I have to say. Now though I shall ignore that and see if the library has it. I think youd enjoy this one, Simon, seeing as you work in the media. Looking forward to reading it as soon as it comes out in paperback. Sounds a little like Joshua Ferris’s Then We Came to the End. I’ve just finished this book (not going to use the word literally out of respect for Herman) and thought it was fantastic. Thanks for your review, Kim, otherwise, I would have never picked it up at the library. I loved the characters and have trouble deciding which chapter I enjoyed best (I love Herman but Abbey or Ruby’s chapters touched me the most). The film should be most interesting!